My Buddy just showed up at my door with this Buck , 11 pointer. 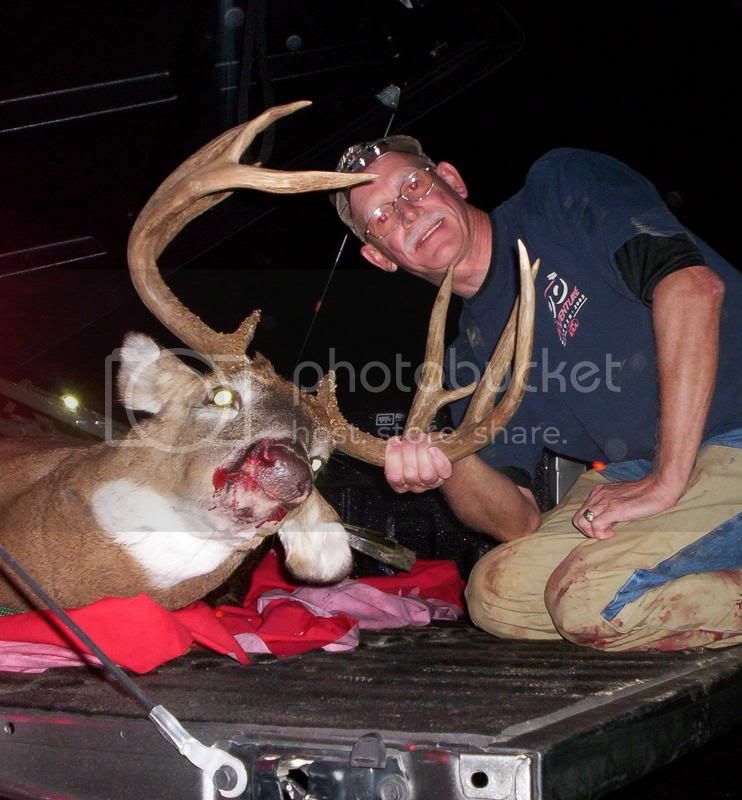 Man is he tickled and who wouldn't be very nice buck he got it with a bow too. Thats a great lookin buck! If I saw that in the woods, I'd pee on myself. I've shot many bucks Joe, but NEVER one even close to the one that your buddy shot. That is one nice deer. Your buddy deserves to be happy. Beautiful animal. It will look awesome with a half body mount. Talking about kids at Xmas, it is opening day for me tomorrow. So much for sleep tonight !!!!! Damn....very nice. I think I just decided not to end my season and try to get a biggun like that after all. Saturday mornin, off to the bush!!! Doing good 204, Still alittle tender though, I had an infection for awhile and almost got put back in the hospital. Doing good now though. Thanks for asking. Tell your buddy...Well Done from an aussie". That is one awesome looking buck. I'm as jealous as they come. Like the others....I want one !! I know this sounds like a silly question, but....what sort of deer is the buck? I am guessing a white tail, but I'm not sure seein' as how we don't have all that many deer here in Australia. Your correct my friend it's a good example of a good mature white tail deer .